I am working on a couple of Christmas Stockings for gifts this upcoming holiday season. They are for siblings so I want them to go together since they will hang in the same place for the next umpteen years. I wanted to have the knitting be easy because I would be working on them at the Farmers Market between customers. I looked over my two different Christmas Stocking Designs shown below. 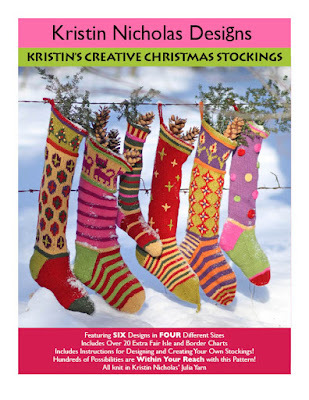 Kristin's Creative Christmas Stockings - Order for $12.00 on my website here or on Ravelry here. 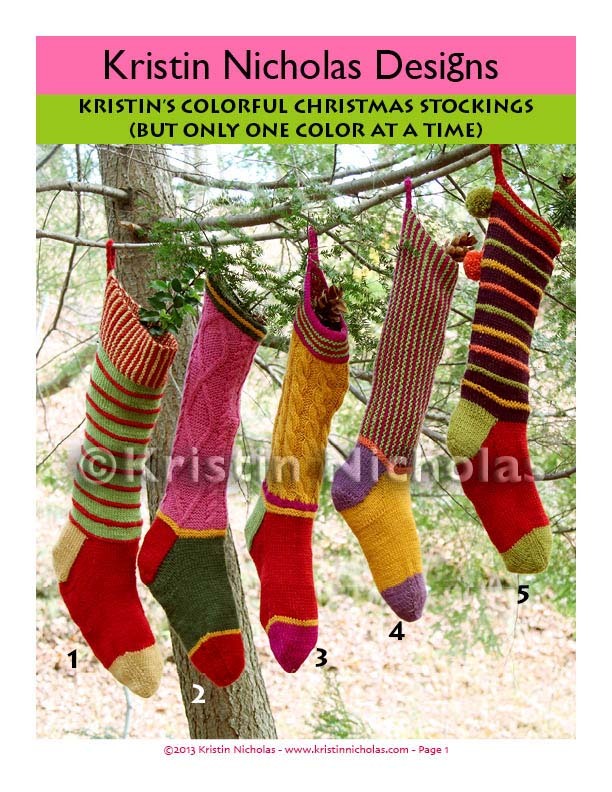 Kristin's Colorful Christmas Stockings - Order for $12.00 on my website here or on Ravelry here. I decided to make a "mash-up" as Julia calls it of the two patterns. Here is my progress so far. This section is from the pattern called "Kristin's Colorful Christmas Stockings" and features 5 designs that are easy - only using one color per row or round. 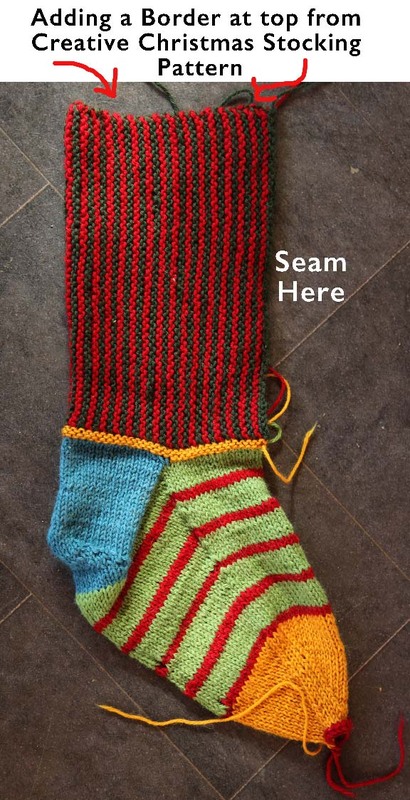 I chose the version with a striped garter stitch leg. You knit the striped garter stitch section first and then pick up the rows along one side and work the heel and foot down. 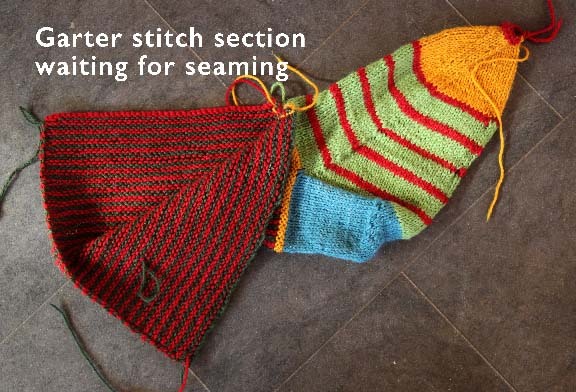 My plan is to add a traditional Fair Isle Border to the top of the striped section using the charts found in the Creative Christmas Stocking Pattern. Do you notice my toe? I like to do the grafting when I am in the mood. What I do to hold the stitches safely is knit a couple rounds on the final number of toe stitches. 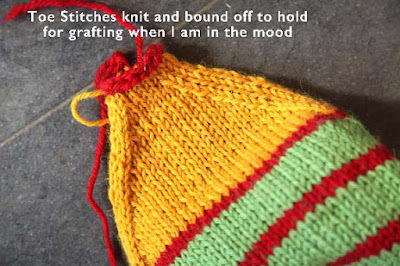 Then I bind off. Later on, I will rip the scrap yarn and pick up the toe stitches to graft them. Thank you to all of you who support me, my work and my family and farm! We are very grateful. Pop in on Sunday morning because I have a surprise for all of you. 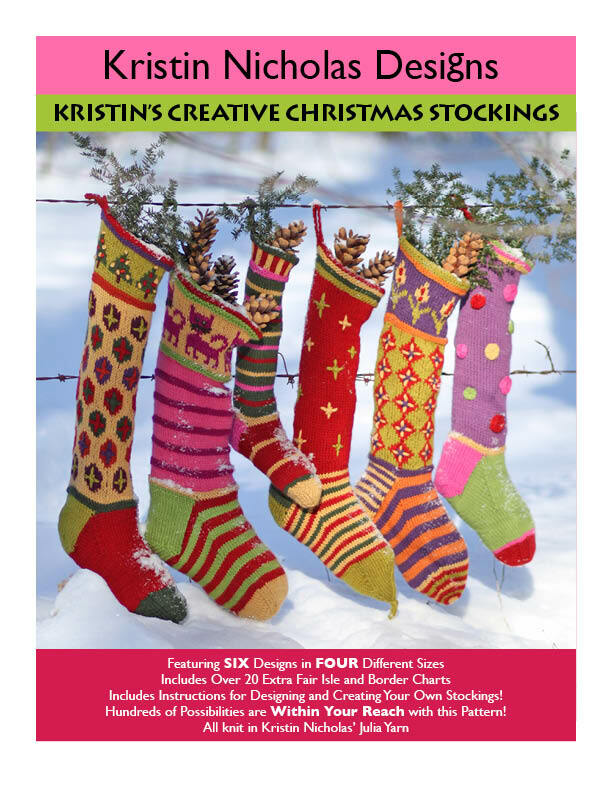 You can order my Christmas Stocking Patterns on my website or on Ravelry. Information below. Love the way you share your creative process. A friend of mine wrote about the talk you gave at the Madison Knitting Guild recently; she loved it! Love, love, love, all your beautiful color combinations!